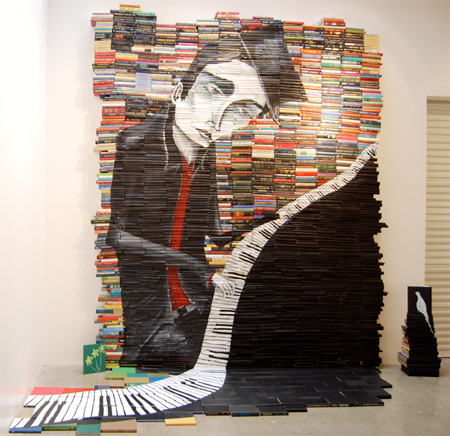 Mike Stilkey creates unique art by painting on the sides of stacked books. Are books ever really old? The words always have meaning.I hate to see books turned useless. 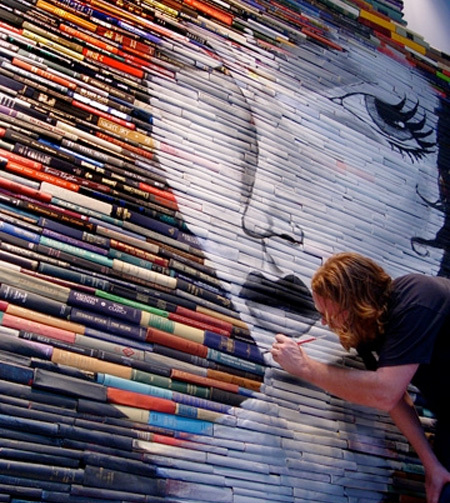 Art isn’t useless. Once the book is read the knowledge is in your head forever. People like Truthiness shouldn’t be able to comment.. I think this is incredibly cool, Imagine libraries looking like this..kids would actually be interested AND put them back in the right place! If the poster who expressed concern over the books being defamed in some way, how about only using the er, ‘works’ of Jackie Collins, Jeffrey Archer et al? Too bad it’s a free country, douche bag. I spend plenty of time in my local public libraries and I can tell you with certainty that it is going to take a lot more than slapping some paint on the spine of a book to get kids into reading again. If all the e-readers available can’t get kids into reading then defacing books isn’t going to either. So after I read a book I should throw it away, or cut it up and make a collage out of it, or put paint on it instead of donating it to my local library, or passing it on to a friend? Bottom line, these paintings could have been done on a bare wall, or any other surface, there was no need to paint on perfectly good books. 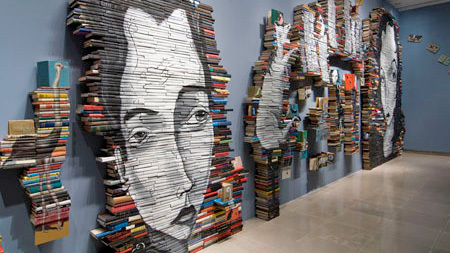 Excuse me for thinking a shelf full of books is pretty artistic all on its own. While I agree that a shelf full of books is artistic all on its own (I mean, the sheer number of permutations in arranging the books can bring different meanings in and of themselves! 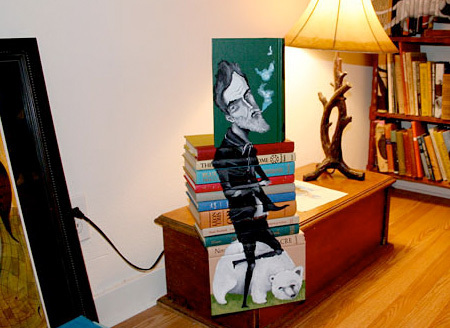 ), I also disagree with your notion that painting on the sides of books makes them useless. They can still be read; they were on the basest of definitions, used as a canvas; and as Christian said, they can be used to draw attention to the books themselves. I mean, how cool would it be, for example, if someone took this idea and made a new series of books where a common overarching theme created a similar image on the spine? (for example, Sweet Valley High books could make a picture of one of the girls, or something). There are so many things to open our eyes to. Totally agree with Truthiness. I don’t see the difference between painting that on paper or on books; except the latter is just a way of trying to seem special and interesting, and at the first glance everybody gasps in awe at something totally redundant. Why not paint on recycled paper? Nobody’s going to miss that. Well, these books aren’t useless. Since when is getting a mark (or paint) on the COVER of a book make them useless? I guess I should forget about the books on my coffee table, that have rings on the cover from long nights of reading and my tea mug. They’re just too defaced and useless. I, personally, love this. It’s no different then when you buy a collection of books, and when they’re all in order it makes an image on the spines (I had a Winnie the Pooh bookset as a child that did this, it made a silhouette of Pooh and Piglet walking through the forest). 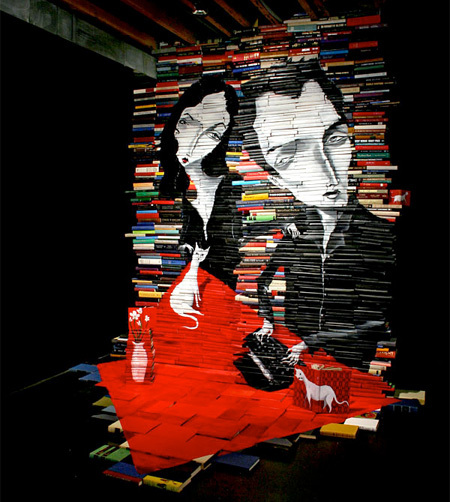 It’s artistic and visually appealing, and I think I might do this with some books in my library… especially the ones that are falling apart at the spine from age. I have to laugh at the people who glorify books and put down digital media like e-readers, all the while they are reading and writing their comments on the internet. 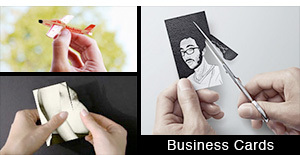 I think it’s very creative. I bet most of those books were being thrown away and heading to the trash heap. They now have a second life. Reduce, REUSE, recycle. Imagine all the people who do throw books away. They would probably be tempted to keep them if they knew it could be made into beautiful art. I think that’s a cool idea. Would be interesting to paint murals on collections/ series’ that relate to them. The books would still be useful and so long as you didn’t soak the spine the bindings would remain intact. 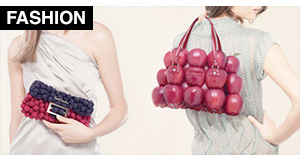 An object is only given the meaning that we envision for it. 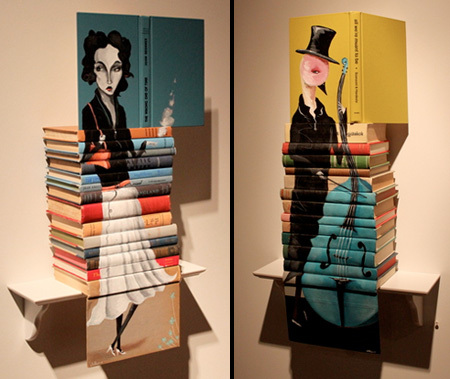 The artist has a very clever idea and why can’t books have other uses? Free speech is what is important. @Paul B. People like you should stop criticizing people every time they say something kind of negative about anything on Toxel. People can say whatever the heck they want. It gets annoying when people are all “You just don’t understand. This is art. You’re just too simple minded to understand.” I’ve seen this a hundred times on Toxel. And yeah people criticize it. That’s is because its art. So if you don’t agree, just make that point. 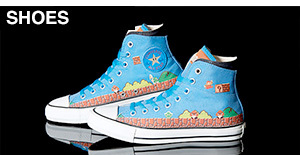 Converse. But don’t tell someone they don’t belong here because you don’t agree with them. Its ridiculous. 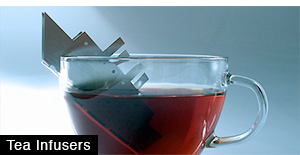 hmmm…cool, but he’d better stay away from my library! 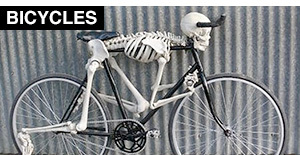 These are absolutley brilliant. A work of art on a work of art? That’s great. 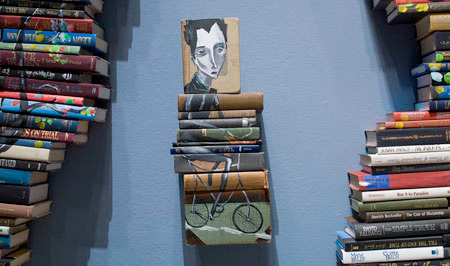 Also good idea on recycling books as art decor that you can later go back and re-read or lend to someone. I don’t rant. I just like making points. I never once put down e-readers, read it again and know what you’re talking about. Read it again. I never mentioned you. Are you feeling guilty? However you did liken e-readers to defacing books. 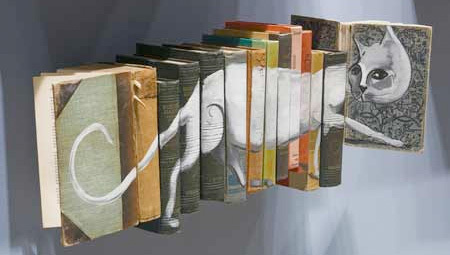 What can I say, old books turned into art! FREAK ART – LOVE IT!!! 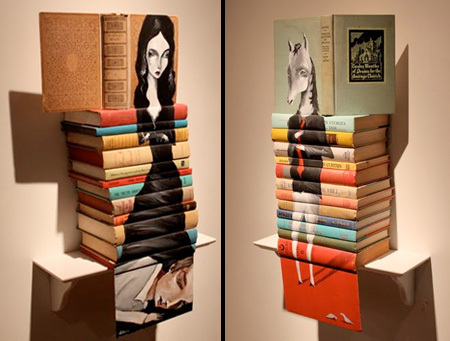 Books are a work of art, of course. Absolutely brilliant paintings, and a wonderful format. As long as the books can be reread or are being used in some fashion and not just tossed in the landfill, I’m all for whatever. The point that no one has made here is that some books do become obsolete. 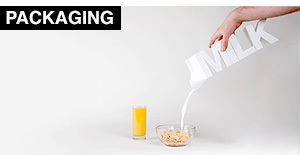 Information changes constantly (e.g., textbooks, esp. about technology). Other than for nostalgic purposes, there is really no need to take up space with many copies of information that society really doesn’t need. We have a wonderful archive called the Library of Congress, if anyone really needs to find a copy of that outdated history book one used in high school. It’s not about understanding a piece, it’s about stifling creativity, if your argument puts down an idea then it shouldn’t be welcome. There’s a difference between critiquing something and shutting down an idea. People thought the Wright Brothers were stupid, crazy, wasteful until they flew. Cant believe people think he is wasting books, incase you didnt know libarys through out books no one wants or reads anymore, just like charity shops. It’s not like theres only one of those books..there’s probley the exact same book in a bin somewhere that no one wants and all Mike Stilkey has done is take some thing that someone else didnt want and turn it into his own amazing piece of art, i love it!